Our bodies need to both work hard and relax if we want to feel our very best. We have everything you need to successfully achieve this. Explore our extensive spa and exercise facilities. A spa experience with us is about more than just hot baths and saunas. Here you can have everything from classic massages to several days of relaxation with tailor-made activities and treatments. Our spa area has a relaxation area, exercise rooms and treatment rooms. 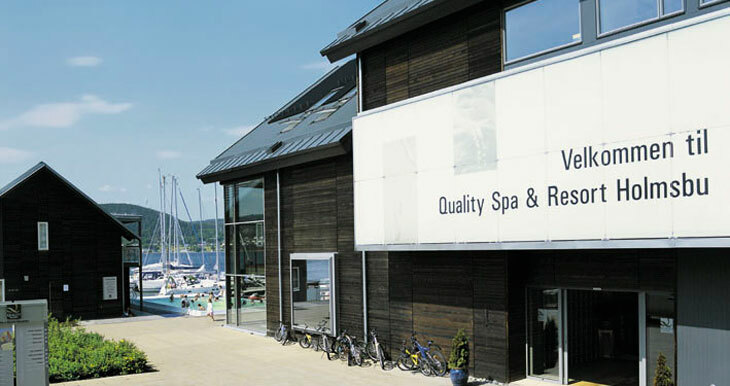 We have both an indoor and outdoor pool, steam room, massage showers, cold pool, saunas with views over the fjord, 12 treatment rooms and a 265 m2 gym with Techno Gym machines. We have an age limit of 16 years in our spa area, except during school holidays and Sundays after 2pm. Together with our supplier Thalgo, we have developed a treatment menu with you as our focus. Our experienced therapists take care of you in a relaxing and calm environment. You get the most out of your spa experience when your body and joints are warmed up and relaxed, for example after an exercise session. Our gym is equipped with many different machines. We also have instructors and an exercise menu to make your session easier, and prepare your body and mind for your spa treatment. Running a spa hotel is a major commitment for us. Our business is built on extensive knowledge and experience so that we can offer you the absolute best available. More information about how we view our spa & spa etiquette here. We recommend that you book your treatments well in advance. Do not hesitate to contact us if you have any questions on +47 32 79 70 00 or at booking@holmsbuspa.no.